Vipers SC players in a recent training session. Photo by Shaban Lubega. 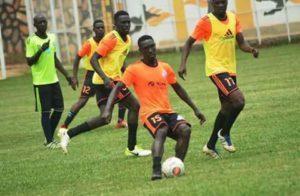 FOOTBALL–All eyes will be on Tadeo Lwanga this evening as the Viper’s midfielder takes on his former side Villa for the very first time since completing his summer move. The fomer SC Villa captain was responsible for one of Vipers’ losses to the Jogoos last season when he inspired his fomer team to a hard fought 2-1 victory away to his current employers, scoring the winner in the process. “It is a big game for us as a team but more so for me as an individual because I’m playing against my former club,” he said. “Of course, I am thankful to them because they gave me a chance to showcase my talent, but football is a job and right now that’s history, all my focus is to help Vipers win,” he added. Miguel Da Costa, Vipers SC coach in an interview with PML Daily, said today’s game is important because his team will be playing a great opponent that challenges for the same targets like them. “We are at home, well prepared and we shall try to play our best and this means winning,” he said. “In our last game in the league, we wasted a lot of chances and later lost concentration and conceded in the late minutes. We have since learnt from our mistakes,” he said. Last season, SC Villa managed a double over Vipers SC, winning 2-1 at Nakivubo stadium and 1-0 at Masaka recreational grounds. Before Villa registered the double over Vipers last season, they had gone 14 matches without registering a win over the Venoms. The encounter tomorrow will be the 25th between the two sides, with Vipers Sc having a better head to head winning 9, losing 5, drawing 10 and scoring 31 while conceding 26. Vipers have lost only one of thier last five league games (W3 D2). The loss was inflicted by today’s opponents SC Villa late last season. The Venoms have not lost any of their last 11 home games in the league (W8 D3). For Villa, they head into the encounter having not lost in any of their last seven league games (W4 D3). SC Villa have scored atleast a goal in all of their last five games away to Vipers in the top flight.